Prepare for an adventure extravaganza; our huge Royal Caribbean FREE DRINKS sale has begun and there’s never been a better time to book a cruise holiday! You can sail on any one of Royal Caribbean's 26 world-class ships to 249 spectacular destinations. Discover destinations such as Dubai, Australia or Hawaii - there is bound to be something to inspire you. If you're booking a sailing from Southmapton on Independence of the Seas or Explorer of the Seas that sails in 2019, you can get up to a massive $400 to spend on board!! For worldwide sailings, we are still giving up to $200 to spend on board on selected sailings! You can even discover your very own 'Perfect Day' at Royal Caribbean's private island - Coco Cay! Not to mention the unforgettable excursions awaiting your arrival, simply decide whether you want epic thrills or tranquil chills. There’s something for everyone. So, what are you waiting for? Get yourself booked for a low deposit today! 5. Onboard spend can only be spent up until 10pm on the final evening of the cruise. It has no cash value, is not transferrable and cannot be used in an onboard casino. Any remaining credit after this time will be removed from the applicable account. 7. The promotion is not combinable with Travel Agent Rates, Cruise and Stay Packages, Interline Rates, Net Tour Op Rates, Gross Tour Op Rates, Friends & Family, Interline (unless otherwise stated) or any form of Non-Revenue price programs such as, but not limited to Seminars at Sea, Perishable Inventory & Complimentary prize winner staterooms. 8. This promotion is only combinable, with Crown & Anchor Discounts, the current campaign offer (namely all-inclusive deluxe drinks and £75pp deposits), Tescos Clubcard bookings, the benefits offered by booking onboard via our Future Cruise Consultants (Reserved or Open Bookings) and Future Cruise Certificates only and is not combinable with any other offer. 9. Options will not be permitted to be held during the Promotion Period. 10. Bookings that are created within the stated campaign period but that subsequently move to either a lower price program and/or non-applicable ship & sailing date will not retain the benefits of this promotion. 11. Bookings created prior to this promotion that wish to access the new benefits of this offer will have to cancel existing booking and make a new booking. Bookings that are cancelled shall be subject to prevailing cancellation charges. 12. Promoter’s standard booking terms and conditions will apply, and are available to view at http://www.royalcaribbean.co.uk/terms-and-conditions. For general booking terms and conditions, guarantee exclusions, cancellation charges & other information and full terms and conditions please refer to the Royal Caribbean 2019-20 second edition brochure, contact your travel agent or visit www.royalcaribbean.co.uk. 13. Promoter reserves the right to cancel, suspend and/or modify this promotion, or any part of it, if any fraud, technical failures, a change in applicable law or any other factor beyond Promoter's reasonable control impairs the integrity or proper functioning of this promotion, as determined by Promoter in its sole discretion. 14. 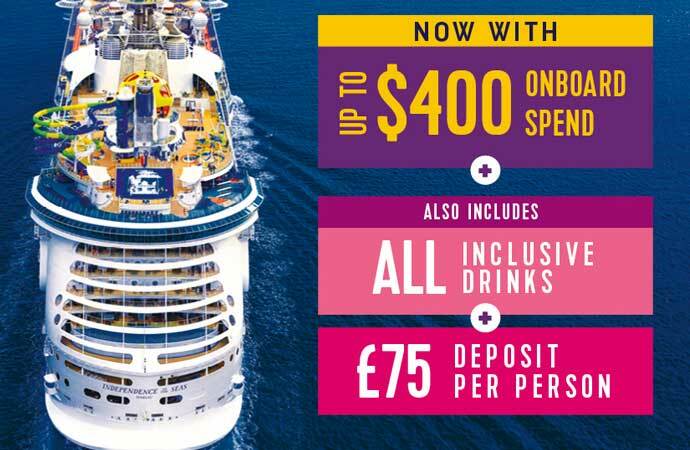 This promotion is sponsored by RCL Cruises Ltd t/a Royal Caribbean International (company number 07366612) with registered office address at Building 3, The Heights, Brooklands, Weybridge, Surrey KT13 0NY.